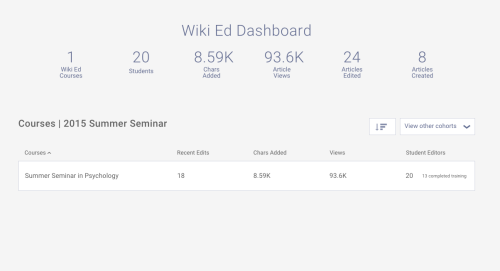 As part of our partnership with the Association for Psychological Sciences, we took on a small pilot this summer to encourage instructors to edit Wikipedia. While we’ve successfully encouraged students to edit through our Classroom Program, their instructors tend to only improve student-written articles, rather than writing their own articles. One of the goals of the APS Wikipedia Initiative is to encourage faculty members to add psychology content. We designed this month-long pilot course for APS members to teach them how to edit Wikipedia. The Summer Seminar in Psychology began in late July, and wrapped up at the end of August. While 20 psychology instructors were interested enough to sign up, only five made mainspace contributions. Four of those five had edited Wikipedia in the past. All told, the participants added slightly less than the equivalent of six printed pages of content to Wikipedia. The contributions participants made were well-written, cited reliable sources, and were formatted correctly. Nonetheless, the amount of output generated by this pilot does not justify the input in terms of cost and staff time. The Wiki Education Foundation considers this a successful pilot. We answered our research question: Would a structured, month-long class in the summer activate instructors to edit Wikipedia? As an organization, we believe in trying experimental pilot programs like this to see if something works. 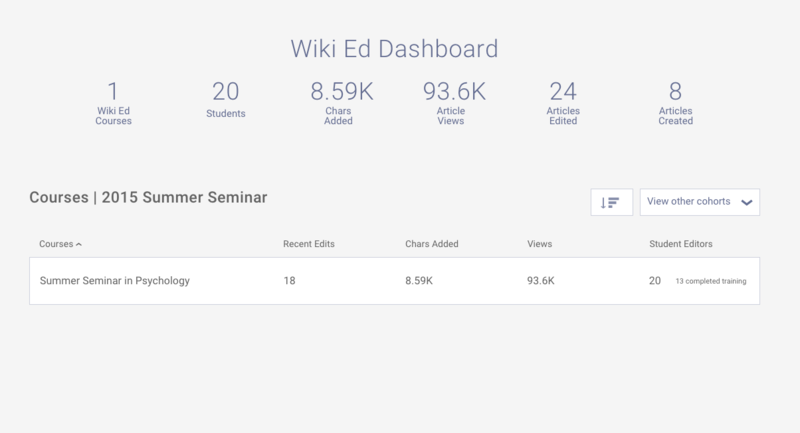 While we found that this program did not work, it has given us ideas for an alternative engagement strategy with instructors to improve Wikipedia, such as an “ask-an-expert” program, which we’d like to pilot in the future. We’d like to extend significant thanks to the Association for Psychological Science for piloting this program with us, and an especially large thank-you to the five participants who made great mainspace contributions, improving Wikipedia’s coverage of psychology topics with their expertise. A longer description of the inputs, activities, outputs, and outcomes, as well as a longer conclusion section, are available in our final program evaluation report of the Summer Seminar pilot.